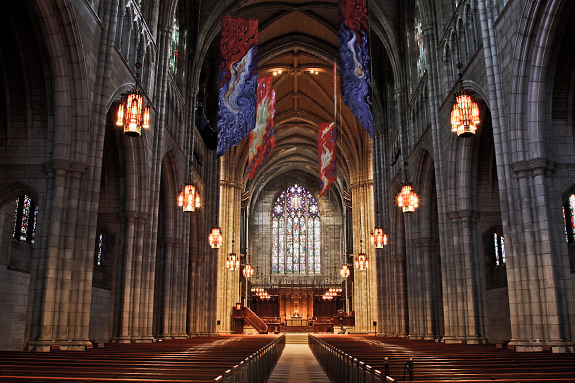 When the Pedaling Parsons — ministers riding bikes to raise money for missions — toured Princeton, their favorite spot was the beautiful Princeton University Chapel. Here is the virtual tour with details on the choir loft carved from wood found in Sherwood Forest, and pews made from gun carriages. What is the scripture for this? My pick is Isaiah 2:4 and what’s yours? It was built in 1928 for $2 million after the Marquand Chapel was destroyed in a fire. The intent was, according to the University history, “to permit the University to maintain its religious heritage, but in a manner that recognized its public mission in an increasingly multicultural society.” I told them about the community -wide services at Thanksgiving and we commiserated on the sad fact that the University Chapel services are held, invariably, at the same time as the PUMC services. Tour it online here.